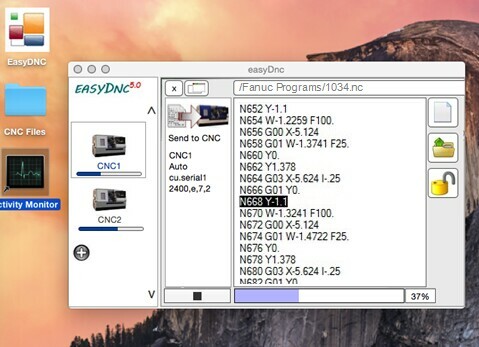 EasyDNC 5.0 DNC for Apple Mac OS X.
EasyDNC for OSX is an easy to use DNC program specifically designed for uploading, downloading and dripfeeding of programs to and from CNC machines. EasyDNC is compact. Small enough to work on lower spec. laptops and those serving just one CNC but it's a Multi-Tasking 64bit application able to manage dozens of separate CNC Profiles and switch instantly from one profile to another or connect to more than one to serve multiple CNCs at the same time. EasyDNC for OSX is a true 64bit Mac App making full use of the latest hardware and multi-core processors. Compatible with Apple iMac, Macbook, MacBook Air, MacBook Pro running any version of OSX 10.9 or higher including the very latest Mojave. << Looking for the Windows version of easyDnc ? too many to list here. Download a fully functional 30 day trial.